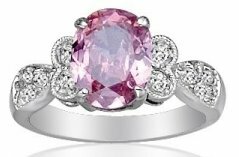 Thanks to TrendToGo.com I got to review one of their beautiful jewerly items! They sent me one of their Women CZ Sterling Silver Rings. I was so excited when I opened the cute box. The Oval Pink CZ Sterling Silver Ring I received is amazing! I am very impressed with the quality and how much this ring sparkles. 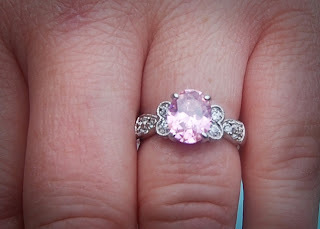 The pretty oval pink tourmaline goes well with several of my outfits. I also love the decorative shank that is encrusted with round white CZs to complete the stunning look. See how gorgeous it is on!! I am excited to wear this designer-inspired fashion ring on my date with my hubby. Make sure and check out TrendToGo.com they have a really beautiful jewelry collection and excellent customer service! wow this ring is so beautiful!!!! I love it!Im going to check out the site now and order me one too! That is SUCH a pretty ring! What a gorgeous ring! I am going to check out their site now. Thanks for another wonderful review Shauna!